Mount Breithaupt Brewery: Backyard I.P.EH? WHOAH. HANG ON A MOMENT. WE CAN'T TALK ABOUT THE LATEST BREW DAY YET. 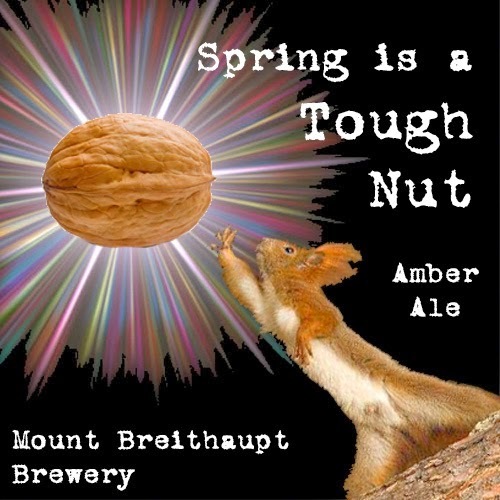 WE HAVE TO CHECK OUT THIS AMAZING LABEL THAT ERIN DID UP FOR SPRING IS A TOUGH NUT. I SAID IT SHOULD PROBABLY HAVE A SQUIRREL. SHE DID THE REST. LOOK UPON IT AND WEEP IN ITS BEAUTY AND I PROMISE I'LL KILL THE ALL CAPS FOR THE REST OF THE POST. WE NOW RETURN YOU TO YOUR REGULARLY SCHEDULED BREW DAY BLOG POST ALREADY IN PROGRESS. Karma? Kismet? Or simple good timing? I was planning to brew a pale ale on Saturday. But then I learned about the Kitchener Waterloo Craft Beer Club's "Homebrew I.P.EH? Get Together" in mid-June: bring a growler of your finest IPA offering to share just a block or two away. The twist is that the recipe has to include some ingredient from the local area. Theoretically that could include "water from the Grand River" according to them, but really, honest ground water pumped from a deep well to a KW tap, loaded with so much calcium that drinking it would bone-spur your teeth into a solid rocky mass, would be more "local" than some foreign liquid that just happened to tumble through Waterloo region by following the so-called path of least resistance. In the brewery, resistance is futile when you have a pump. I will not take that path of least resistance. Not when I have a pound and a half* of "Cascade backyard mix" sitting in the freezer. With six weeks to the event, the stars aligned, and I threw caution to the wind that filled my sails. With a book value of 85 IBU (though I've had a history of low utilization from my backyard hops, so I don't trust that), and so much hop mass in the kettle that I had trouble stirring the brew during chilling, this should be a real hop-forward IPA. Even better, if I walk the growler down to Guelph St., then none of the hops in this beer will have ever been transported by vehicle. How local is that, hmm? Pretty goddamn local, I'd say. I admit: while formulating this recipe, I read this blog post that talked about how if you're doing an IPA, you just can't shy off the hops. It made me revisit it and increase the hop schedule. And then increase it again. 10 gallon batches sometimes have some scary numbers that come with doubling every ingredient, but 25 ounces of hops is pretty terrifying to someone who came into homebrewing during the great hop shortage of '07-08, paying $3-5 per precious ounce. As with the Spring is a Tough Nut, Backyard I.P.EH? is being fermented separately with different yeasts. English ale yeast S-04 in one (my experience with Tough Nut is that the S-04 version was fantastically better and the Bertus Brewery blog post above suggested it as an interesting IPA yeast option despite its seemingly incompatible heritage) and WLP-001 California yeast in the other. YOU REMEMBER SPRING IS A TOUGH NUT? Anyway, the WLP yeast is a liquid yeast, something I've never tried before, but the good folks at OBK have made liquid yeast a viable and economical choice now! The immensely wide range of liquid yeast varieties beckons: while there are 6-8 useful and accessible dry yeasts around, there are dozens to choose from in liquid form. They just don't keep as easily. As of this writing, the WLP fermenter has kicked off nicely. The S-04 is still lagging, but that seems to be its lot. The fermentation temperature is still fairly low thanks to lingering cold ground chilling our basement... the fermenters are at about 62-64F, which slows the yeast activity down, but I do like the clean fermentation that results. * So it turns out I didn't have a pound and a half of the Cascade. I ran out. I had to do some late substitution of 2012 harvest Zeus (last featured here) which is unfortunate because... it's best used as a bittering hop and has a distinct character. Even after 18 months in the freezer, it packs a powerful nose. The beer will be different because of it. But, you know, roll with it! Mash went well. Took 75 minutes+ at what was initially 150-152. Mashout a bit weird, added only 9qt of specified 13.5qt, seemed to bring temp up to 168 (but then it must have dropped a lot because during initial sparge temp was only about 154.) Initial runnings gravity 1.088. Late runnings still 1.020+. Got a lot of extra liquid out of the mash bed with a slow lauter late, into an almost boiling wort. I added an extra 0.5 gal to Beersmith (1.0 total) for trub loss due to heavy hop mass. Good thing, but it was still an underestimate. Only 10gal in fermenters, so needed to add at least another .5. 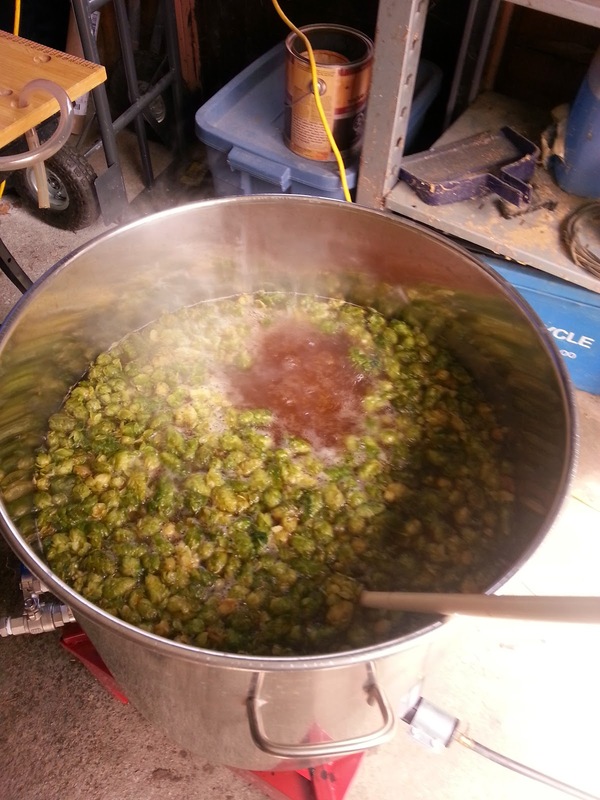 Rule of thumb: 1 gallon per pound of leaf hops?